RAPAPORT... Graff has unveiled the 67 polished stones it cut from the 1,109-carat Lesedi La Rona, including a record-breaking 302-carat diamond. The jeweler has named the square emerald-cut, 302.37-carat, D-color diamond the Graff Lesedi La Rona. It has yet to receive final certification for the stone, but expects a “very high clarity grading,” a Graff spokesperson told Rapaport News Wednesday. If it turns out to be flawless, it would be the largest D-flawless the Gemological Institute of America (GIA) has graded, the spokesperson added. It’s also the largest of its shape in history, according to the company. The entire process, from discovery through the cutting and polishing stages, took more than 18 months. 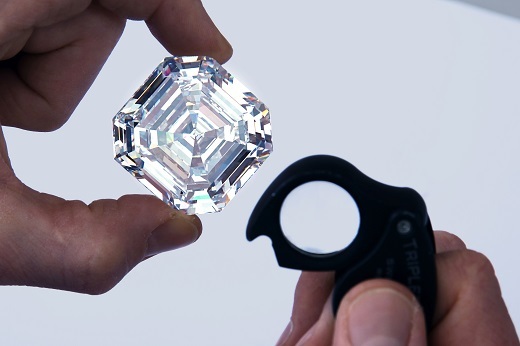 Inspecting the diamond presented a challenge to Graff’s gemologists, as the stone was too large for the company’s equipment, the jeweler said. Graff built a custom scanner specifically for the Lesedi La Rona. Graff initially thought it wouldn’t be able to create a polished diamond weighing more than 300 carats from the rough. However, further assessments, carried out over the course of a few months, determined that Graff could produce a stone of that size. The jeweler planned out each stage of the process, including the initial laser cutting, the shaping, as well as the faceting. It took hundreds of hours to polish the table, the facet at the top of the diamond, Graff noted. The company polished an additional 66 “satellite” diamonds from the same rough. They range from under 1 carat to more than 26 carats. Each diamond is inscribed with the words “Graff” and “Lesedi La Rona,” as well as the GIA report number. Lucara Diamond Corp. unearthed the 1,109-carat Lesedi La Rona in November 2016 at its Karowe mine in Botswana. It was the second-largest gem-quality diamond in history after the 3,106-carat Cullinan diamond. Graff has donated fragments of the Lesedi La Rona to the Smithsonian Institute, where they will be used to help advance diamond research.